The winner of the Rwanda Green Growth Media Award has been announced during celebrations of the Africa Day of Information in Kigali. 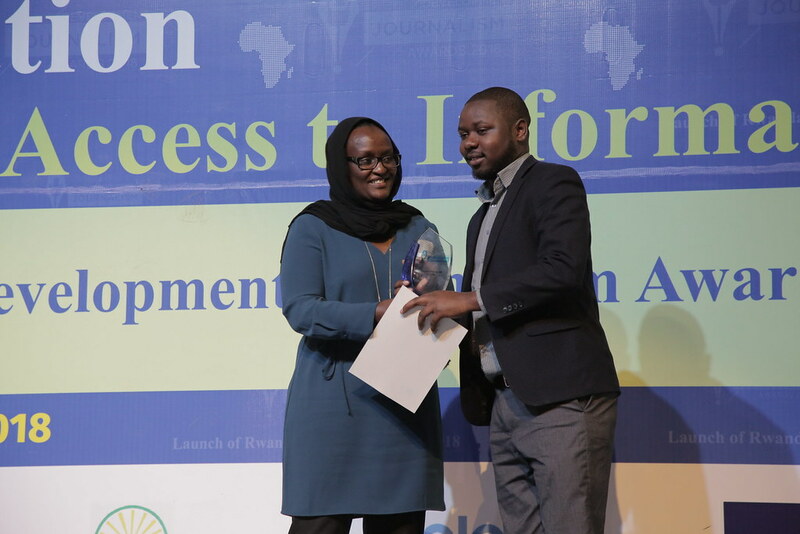 The award was one of a number of categories for this year’s Development Journalism Awards, which were jointly organised by the Rwanda Governance Board and the Rwanda Journalists Association. The awards honour excellence and professionalism by recognising the best-performing journalists and media houses. The Ministry of Environment was proud to sponsor and present the award to the winner, as well as the first and second runners-up, in the Green Growth Media Award category. A total of 56 applications were received for the award, including 31 for broadcast and 25 for online. The award recognises outstanding journalists who contribute to advancing and raising awareness about green growth initiatives in Rwanda. PS Mukarubibi thanked all journalists who submitted applications and to the judges for their time in selecting the top three winners and encouraged all to keep working together to build a green and climate resilient Rwanda. The winner receives a cash prize and has been invited to attend the annual UN Climate Talks taking place in Poland in December, known as COP24. The First Runner-up and the Second Runner-Up also received a cash prize. The Top Ten finalists are invited to attend the Africa Green Growth Forum in Kigali from 26-30 November 2018. The Rwanda Green Growth Media Award shines a light on the efforts of journalists and media houses that report about sustainable development and raise awareness about challenges and opportunities in the environment sector as they relate to green growth. The award was given to the Top Three journalists after careful selection by an expert panel against specific criteria. The award was created as part of the Africa Green Growth Forum, which is taking place from 26-30 November 2018. The forum brings together green investors, experts, policy makers, and environmental entrepreneurs to advance green growth across the continent.